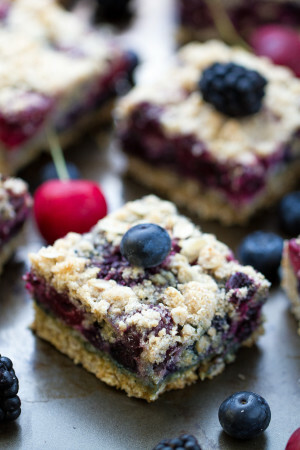 Lemon Blueberry Crumble Bars make the perfect easy summer treat. Filled with a sweet and juicy blueberry & lemon filling. 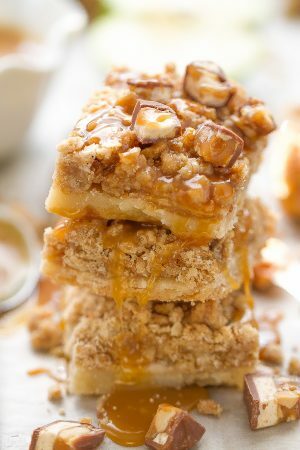 Best of all with this simple recipe, the buttery oatmeal streusel crust doubles as the topping. Blueberries are one of my favorite things about summer. As soon as they are in season, I can never resist buying them by the boat load. Most of the time we just enjoy them straight from the bowl but at least once a year, I love tossing whatever summer fruit I have on hand together with a buttery streusel crust. As much as I try to avoid turning on the oven during the summer by making no bake treats, I always make an exception for fruity crumb bars – they are absolutely worth heating up the house for. Just like these Caramel Apple Pie Bars and Fresh Cherry Berry Crumble Bars – these Blueberry Lemon Crumble Bars show up regularly at our house year after year. They are one of the easiest customizable desserts to make from scratch. The best part is that you can really use whatever berries or summer fruit you have. They start off with a buttery crumb topping made with flour, oats, brown and white sugar, lemon zest and some cold butter. The wonderful thing about these bars is that the crust doubles as the topping. The delectable filling is made with fresh blueberries, a touch of lemon, corn starch and sweetener. I used maple syrup this time but you can totally use granulated sugar or coconut sugar if you like. Feel free to swap in frozen blueberries if you’d like or during the winter when fresh berries aren’t in season — simply thaw and pat dry. These Lemon Blueberry Crumb Bars would make a special indulgent breakfast or afternoon treat warmed up with a scoop of ice cream. The portable size also make them perfect to bring along to your next barbecue, potluck or summer party. Preheat the oven to 375°F. Line a 9 x 9 inch square pan with parchment paper or aluminum foil and spray with non-stick cooking spray. In a medium bowl, combine the berries with maple syrup, cornstarch and lemon juice, and toss to coat. Set aside while you prepare the dough. Make the dough: In a large bowl, whisk together the flour, oats, sugars, baking powder, salt and lemon zest. With a fork, pastry cutter, or using your clean hands, cut butter into flour mixture together until it resembles coarse crumbs. Bake in preheated oven for 40-45 minutes, or until top is golden brown. Allow to cool completely before cutting into squares or enjoy straight from the pan if desired. Store bars in an airtight container in refrigerator. *I used a 9x9 pan, you can use an 8x8 pan but the bars will be thicker. If using a 9x13 pan, the bars might not be as thick as pictured so you might want to increase the amounts.